Methodologies - Identifiable techniques that can be widely used in the area of study. Assumed to be of broad use. A technique of limited use is not a methodology. Likely this would not refer to a theory or approach to a general problem. 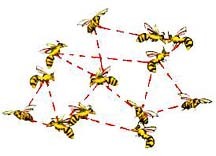 Self-organizing - (preferred over emerging) the ability of a distributed system to exhibit global structures or dynamics from local rules or interactions. Emergent - as in an emergent property: one which cannot be observed locally in the subsystems, but only as a global structure or dynamic. We limit the usage to an emergent property or structure and not as an emergent system. Complexity - Generally avoided as an overused and poorly defined word, except in specific systems. Experiments - activities that produce data or test concepts. Simulations are a subset of experiments, which are abstracted from the system that they model (or simulate). Agents - an entity that moves through a system of interest - it has processing capability and memory (also see nodal). An agent includes people as well as "artificial" agents. Agents have the perspective of moving through informational space and not being restricted to a specific location in space. In numerical methods this concept is analogous to a Lagrangian treatment or approach. Hence, usage includes: agent approach, agent behavior, agent perspective, agent methods, etc. Note that an agent can be defined in a discrete space (a graph) in a nodal representation without loss of functionality, but only if all nodes contain the agent capability. Nodes/nodal - (opposite of agent). Nodes have the perspective of being restricted to a specific location in space and not moving through informational space. In numerical methods this concept is analogous to an Eulerian treatment or approach. Hence, useful usage includes: nodal approach, nodal perspective, nodal methods, etc. Problem solving - used in both a traditional sense of the act of a centralized problem solver, either a human or organization or a computing system. And also in the less accepted sense of a "solution" found by a self-organizing system. If the solution is a global property that is not observable locally, then it is an emergent property. Collective - a more fuzzy word for self-organizing.